NEW YORK (January 14, 2015) – Nick Foligno of the Columbus Blue Jackets and Jonathan Toews of the Chicago Blackhawks have been named team Captains for the 2015 NHL All-Star Weekend in Columbus, the National Hockey League (NHL®) announced today. 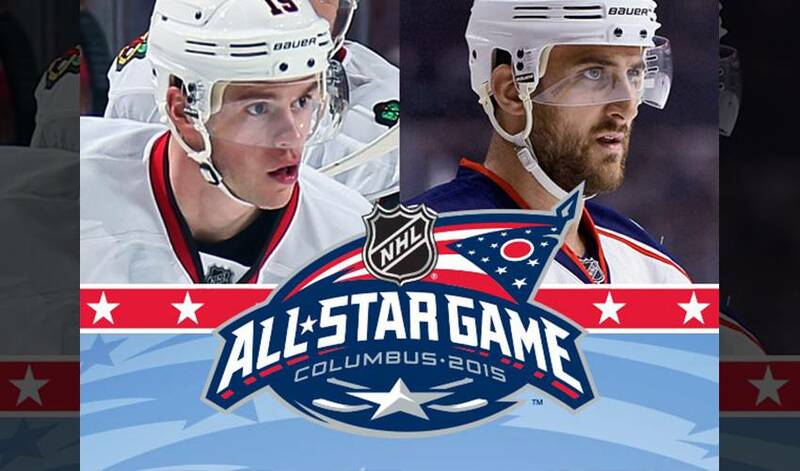 The NHL All-Star teams are now designated as Team Foligno and Team Toews. In addition, Drew Doughty of the Los Angeles Kings and Patrick Kane of the Blackhawks have been named Assistant Captains of Team Foligno, while Ryan Getzlaf of the Anaheim Ducks and Rick Nash of the New York Rangers have been named Assistant Captains of Team Toews. The Captains and Assistant Captains were selected by NHL Hockey Operations in consultation with players selected as 2015 NHL All-Stars and will lead the 2015 Honda NHL® All-Star Game team selection process during the NHL All-Star Fantasy Draft™ presented by DraftKings on Friday, Jan. 23. The Captains and Assistant Captains also will set their team rosters for the Honda NHL All-Star Skills Competition™ on Jan. 24. As Captains, Foligno and Toews will wear a “C” on their jerseys, while Doughty, Kane, Getzlaf and Nash will wear an “A” on theirs. Team Foligno is designated as the home team and will wear the previously unveiled black Reebok NHL All-Star jerseys, helmets, socks and pants. Team Toews is designated as the visiting team and will wear the white jerseys, helmets and socks, along with black pants. Team Foligno will be coached by Los Angeles Kings head coach Darryl Sutter and members of his Los Angeles coaching staff and Team Toews will be coached by Nashville Predators bench boss Peter Laviolette and members of his Nashville coaching staff. Representing the hometown Blue Jackets, Foligno is playing in his eighth NHL season and third with Columbus. The 27-year-old Buffalo, NY, native leads the Blue Jackets in goals (18) and points (40) in 2014-15, and is among the NHL leaders in goals (t-12th), points (t-15th), power play goals (9, t-3rd) and power play points (20, 3rd). Toews, who serves as the captain of the Blackhawks, will be making his fourth career NHL All-Star Game appearance. The 26-year-old Winnipeg, Manitoba, native ranks second on the Blackhawks in goals, assists and points (13-25—38) this season and collected 1,217,210 votes to finish third overall in this year’s 2015 NHL All-Star Fan Vote presented by SiriusXM™. Doughty will represent the defending Stanley Cup champion Kings in his first career NHL All-Star Game appearance. The 25-year-old London, Ontario, native is among the League’s leading defensemen in assists (23, t-6th) and points (27, t-11th), and is second in the NHL in time on ice, averaging 29:19 per game. Kane, another Buffalo native, will be making his fourth NHL All-Star Game appearance and second as an Assistant Captain (2012, Team Lidstrom). The 26-year-old leads Chicago in goals, assists and points (20-27—47) this season and ranks in the top-11 of each category within the League. Kane collected 1,232,201 NHL All-Star Fan Votes, narrowly edging his Blackhawks teammate, Toews, to finish second overall in this year’s balloting. Getzlaf, Anaheim’s captain, will be making his third NHL All-Star Game appearance. The 29-year-old Regina, Saskatchewan, native leads the Ducks with 45 points (13-32—45), a mark that ranks him ninth in the League. Nash will be making his sixth NHL All-Star Game appearance. The 30-year-old Brampton, Ontario, native spent his first nine seasons with the Blue Jackets, and returns to Columbus in his first NHL All-Star Game as a member of the Rangers. With 41 points, Nash is the Rangers’ leading scorer this season and is tied for the League lead in goals with 26. The 2015 NHL All-Star Fantasy Draft™ presented by DraftKings will be held on Friday, Jan. 23, to complete the rosters for Team Foligno and Team Toews. The draft will be televised on NBCSN in the U.S. and on Sportsnet and TVA Sports in Canada at 8 p.m. ET live from the Greater Columbus Convention Center.